World 4-1 is the first level of World 4 in New Super Mario Bros. 2. It is a snowy level heavily occupied with Icy Spiked Balls and Goombas. The player begins in front of a slope where several Mini Goombas roam about. Following that, there is an Icy Spiked Ball, acting like a regular Spiked Ball. They deflect upon hitting a wall or gravity pulls them down on a slope. Above that is a ? Block containing a Super Leaf. More Mini Goombas and a larger version of the ice boulder appear, followed by a rope on the ceiling to help Mario cross the area with Icy Spiked Balls below. Following that is a red Koopa Troopa, followed by another Icy Spiked Ball rolling up and down slopes on the ground. A Gold Flower can be found in a Brick Block before the Checkpoint Flag by using a Koopa Shell. A ? Block containing a Super Leaf can then be found, followed by some Mini Goombas and Icy Spiked Balls. Going up the structure, the ground switches to ice and thus is slippery. 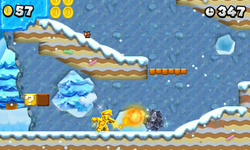 Reaching the top, the player can find a Gold Ring and some Koopa Troopas where he could earn coins by sliding down the slope. At the end of the slope, an Icy Spiked Ball rolls opposite, so Mario has to duck. Immediately after that is the flagpole. Star Coin 1: The Star Coin is located in the area where Mario climbs the rope on a ceiling. There are ice boulders that continuously move about, thus obstructing the path to the Star Coin. Mario needs to get of the rope when he is above a Donut Lift at the right time, preferably on the left or right side instead of the one in the middle. Then the Star Coin is within reach. Star Coin 2: Located above the checkpoint. When Mario reaches the slopey, part of the level before the checkpoint, where the ground is hilly, Mario will need to jump to the second orange platform with a Koopa Troopa. He will need to bounce off the Koopa to find a higher orange platform above. Continuing towards the right will lead Mario to the Star Coin. Star Coin 3: When Mario reaches the top of the structure after the checkpoint, the player will notice a ledge further up. Jump to that area from the incline in the ground to reach the ledge and find the Star Coin. This page was last edited on April 13, 2019, at 08:49.